Summary: From this article, you will learn some useful tips to speed up iOS 12 on iPhone, iPad or iPod touch, which will make your iOS system as well as the iDevice run faster and smoother. Although it rarely happens, some users do find that iOS 12 would slow down the speed of the device operation. In this case, you must want to speed up iOS 12 on your iPhone, iPad or iPod touch, right? But how to achieve this goal? It is easy! We have collected and tested some useful tips and solutions for this problem and we will list them in this tutorial. Just read on to get them. The possible reasons for the slow iOS 12 would be the cumbrous system settings and huge files. Therefore, to speed up the operating system, you can try to erase all the system settings and files on your iDevice. For most users, this erasing process would be troublesome and time-consuming. But if you have the MobiKin Eraser for iOS, you can complete it with simple clicks. What is MobiKin Eraser for iOS? 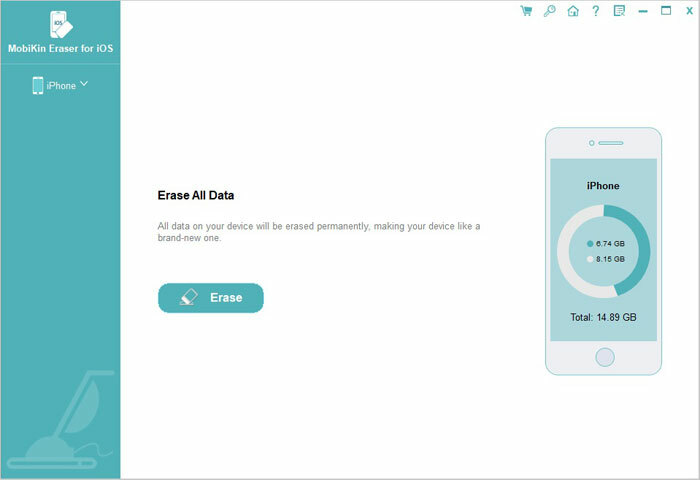 MobiKin Eraser for iOS is a software that can help users to permanently remove all files on iOS device, including existing and deleted files, system settings, private data and other files. 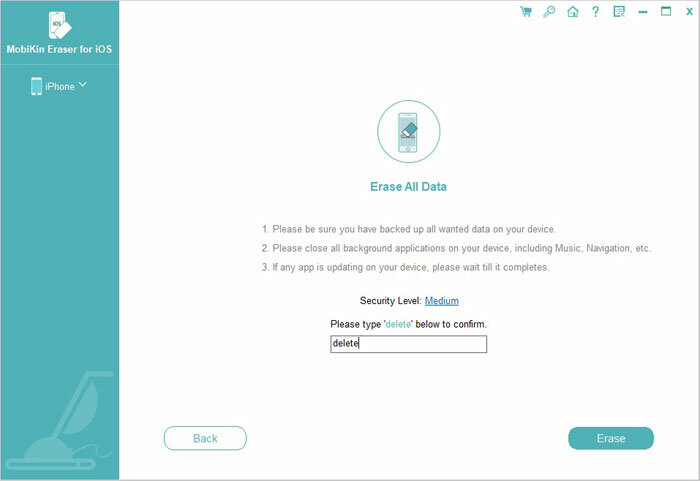 After the erasure, the data on your device will be completely wiped and cannot be recovered anymore. This will make your iPhone/iPad/iPod like a brand new one. Notice: All the files erased by this tool will be unrecoverable, so please back up your wanted files before you start the erasing process. Now you can download and install the program on your computer by clicking the icon below and then go with the steps to speed up iOS 12. Step 1. Launch the installed software on your computer and you will get an interface as below. 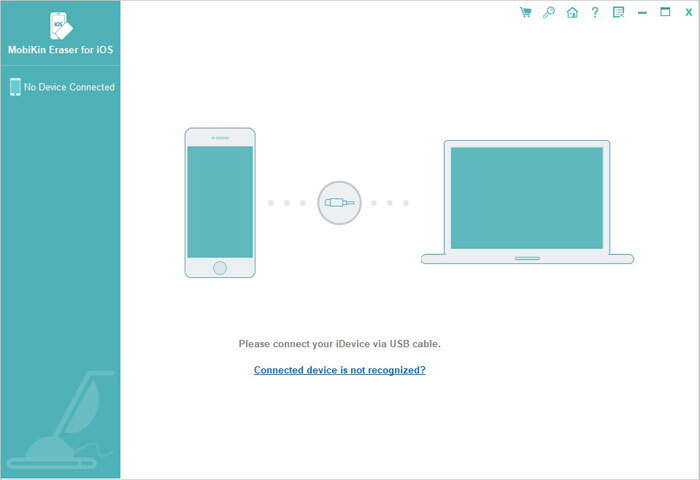 Then you should install the latest iTunes on your computer if required and use a USB cable to build a connection. Step 2. After that, the program may ask you to trust the computer. 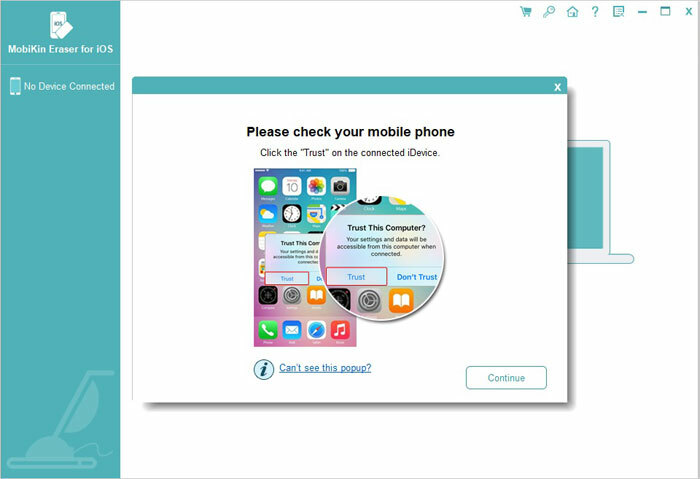 Just tap on "Trust" on your device to make the connected device be recognized. Step 3. When the tool detects your iDevice successfully, you will get the following interface. To go on, you should tap on "Erase" and then close "iTunes" and "Find My iPhone" if prompted. Step 4. Then you can tap on "Medium" on the interface to choose a security level and tap on "OK" to confirm your option. Step 5. Now you would be on the "Erase All Data" interface. Here you need to type in "delete" in the input box and tap on "Erase". After that, the program will start to erase the data on your iDevice. Here, if you choose the low security level before, the program will restart your device after the erasure. 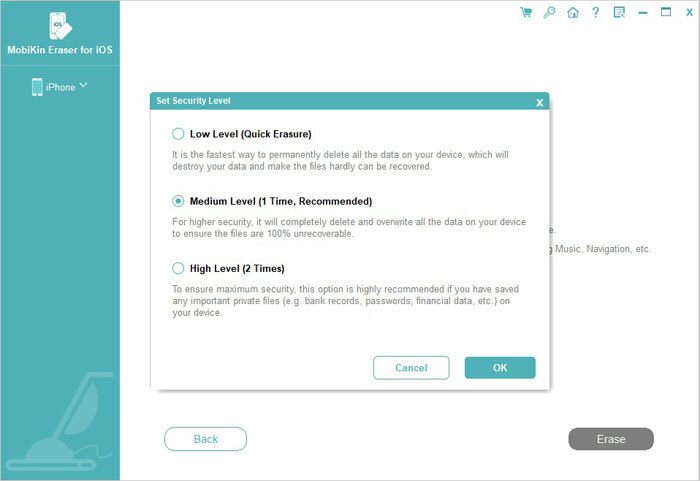 But if you select the medium security level, it will go on to overwrite your phone data. If you elect the high security level, it will overwrite the data two times. How to Speed Up iPhone XS, iPhone XS Max or iPhone XR? - For iPhone 6S or earlier iPhone, you can press and hold the "Home" and "Power" buttons at the same time until the Apple logo appears. - For iPhone 7 or iPhone 7 Plus, please press the "Power" and "Volume Down" keys simultaneously. And release them while the Apple logo appears. - For iPhone X/8/8 Plus and newer device, you need to quickly press and release the "Volume Up" button and then quickly hold down and release the "Volume Down" button. Next, press and hold the "Power" button till you see the Apple logo. When the iDevice is updated to iOS 12, some applications in old version might not run properly on the new system. So to ensure the smooth running of the Apps and operating system, you need to update them to the newest version. - Background App Refresh: Go to "Settings > General > Background App Refresh" to turn it off. - Location Services: Navigate to "Settings > Privacy > Location Services" to disable the service. - Automatic Downloads: Visit "Settings > iTunes & App Store > turn off Updates". - Siri Lookup & Suggestions: Click on "Settings > Siri & Search > Suggestions in Search and Suggestions in Look Up" to turn them off. - Reduce Motion: Open "Settings > General > Accessibility > Reduce motion" to turn on the function. - Reduce Transparency: Tap on "Settings > General > Accessibility > Increase contrast > enable Reduce transparency". The wallpapers that you use would affect the running of iOS 12 also. Hence, it is advisable for you to use a simple and small picture as your wallpaper. To change the wallpaper, you can go to "Settings" and find the "Wallpaper" option. Then you can elect some simple images and put them on the Home screen. Everyone knows that applications take up a lot of space of the system and device. Hence, if you wish to speed up the iOS and iOS device, you'd better give up some applications that you rarely use. Just simply find out the App on Home screen and long press its icon until an "X" appears. Then tap on the "X" icon to delete the application. An optimal performance of iPhone or iPad requires sufficient free storage. In general, the device should have at least 10% free storage available. To confirm that, you can go to "Settings > General > Storage". If the free storage space is less than 10%, then you need to delete some less important or useless files on the device to free up the space. One of the powerful methods to speed up the iOS performance is to reset system settings. This will remove all settings on your device and you need to configure the settings on your device again. If you have interested in it, you can have a try: click "Settings" and then choose "General" in the section. Then tap on "Reset > Reset All Settings". - Back up your iOS files to iTunes or iCloud. - Connect your iDevice to computer and launch iTunes. On the primary interface of iTunes, you can tap on your device and choose "Summary". Then you can go on to choose the option "Restore Backup...". If iOS 12 still runs slowly after using the methods above, maybe your device is not compatible with the new system. Then in this case, you can attempt to downgrade iOS 12. But this must be your last option since it is risky. These are all the tips and solutions for how to speed up iOS 12. If you have any different opinion about this topic, you can leave a comment below or contact us.